Cassidian has completed assembly of individual major structural components for the Eurofighter Typhoon Instrumented Production Aircraft 8 (IPA 8), marking a significant production milestone at its facility in Manching, Germany. Besides mounting of the IPA 8 test aircraft’s right wing, the company has also connected the cockpit, vertical tail unit and wings with the fuselage. Cassidian Eurofighter programme manager Berndt Wuensche said the IPA 8 is based on the latest Eurofighter Tranche 3 construction configuration and is also equipped with advanced flight test instrumentation. "IPA 8 can make essential contributions to further developing Eurofighter capabilities in the coming decades – for example, electronic beam scanning for radar, enhanced weapon integration and improvements to mission equipment," Wuensche added. The company is currently installing the aircraft’s hydraulic, defensive aids and electrical systems, as well as complex special cabling at the final assembly line in Manching. More than 110km of cable have already been installed by the company’s engineers in the past few months, in addition to pressure, flow and electrical data sensors, computer and test flight instrumentation systems. "The company is currently installing the aircraft’s hydraulic, defensive aids and electrical systems." The installation enables all the relevant aircraft parameters to establish real-time communications from the air to flight test engineers on the ground. IPA 8 aircraft is available to all four of the Eurofighter programme’s partner nations to evaluate new capabilities according to their developmental requirements. Manufactured by a consortium of EADS, Alenia Aeronautica and BAE, Typhoon is a twin-engine, canard-delta wing, multirole fighter designed for deployment during air operations, including air policing, peace support and high-intensity conflict missions worldwide. Typhoon covers serial production of 559 aircraft in three tranches for the air forces of Austria, Italy, Germany, Saudi Arabia, Spain and the UK. 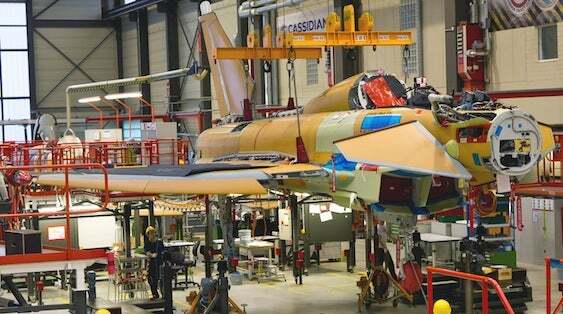 Image: Eurofighter IPA 8 test aircraft being assembled in Maching, Germany. Photo courtesy of © 2012 CASSIDIAN.